"Don't worry Ivan, I know that they shrink with age but I can still see it my darling"
While Agnes did not attend her husbands funeral, she was keen to see him buried. "Ignore gran. She's at that funny espionage." Well we were all glad that scientist were able to bring my nan back to life, using gentic DNA cross breeding. It's just a pity they cross bred her with a hammerhead shark. After 45 years on the street, Gail Platt now struggles to read the script. ''The Spy Who Came In From The Cold'' and put the gas fire on immediately. "So there's where I put my dentures." "Where's this f*cking postman with the Woolworths catalogue"
"Time of death, 09:03, you can put the lens caps on now Nurse." This is all very funny until she removes the binoculars to reveal two glass lenses in her skull. "Ethyl was having a hard time with stares..."
So how did you get on with the new gynaecologist love? "Though their relationship was strained...Kate still liked seeing her daughter." "Mmm, I like the one on the park bench..."
"With the binoculars, Mabel LOOKED much better - but believe me - she didn't look better." "Your disguise doesn't fool us, Marcelo Bielsa!" "I didn't know that old Mrs Evans was into Ornithology"
"You misunderstood me. I said that she was a curtain twitcher"
"How long does a John Lewis audition take!" " She runs our local neighbourhood watch scheme. 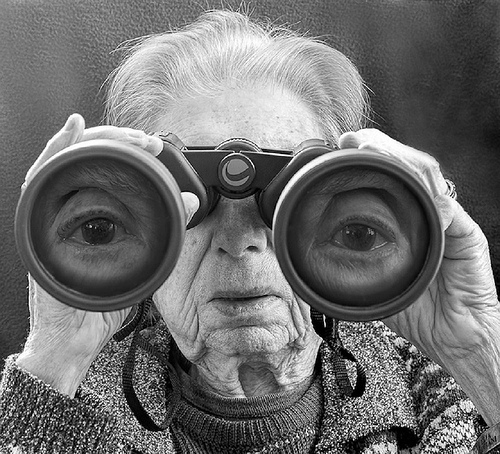 Nothing gets past 'Big Iris'"
Doris liked to keep an eye on her pupils. "I spy with my big eyes." I've noticed that Margaret Becket pays a lot more attention to her expenses claim sheets these days. He looks like a right Wall-E!